Our telephone crisis counsellors are frequently asked to provide women with referrals to individual and/or group counselling. Many of the women that call our Helpline have encountered violence in the form of partner abuse, childhood abuse, sexual assault and ritual abuse. 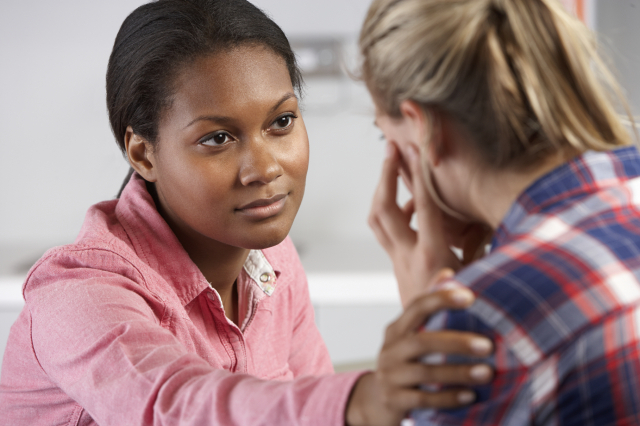 Counselling is central to the healing process for assaulted women. We attempt to provide women with the names of at least three (3) counsellors or therapists whom they may contact to initiate short or long term counselling, keeping in mind her particular needs. We are occasionally asked by a client for referrals within her particular community. This community may be one of the culturally linguistic, racial and religious, diverse communities. We are currently looking to add additional therapists to our referral list, especially those from the diverse ethno-cultural communities. The completed questionnaire will be evaluated, following which a letter will be sent to you indicating whether or not your name has been added to our referral list. Exclusion from the list would generally be based on a difference of philosophy between yourself and our agency. Should there be a need to clarify any response on the questionnaire, we will contact you by telephone to do so. Occasionally clients complain to our counsellors about their therapists. We always encourage the woman to go back to her therapist and try to deal directly with her complaint or dissatisfaction. Inclusion on our referral list implies some degree of endorsement by the Helpline; as such, we may find it necessary to contact you regarding any serious complaints. We reserve the right to remove your name from our list at any time we deem necessary, especially In cases where client confidentiality cannot be guaranteed. We are occasionally asked by a client for referrals within her particular community. This community may be one of the many culturally diverse communities in Ontario. To this end, we are always looking to add therapists from these communities to our referral list. We appreciate the time you will take to complete the questionnaire and look forward to receiving the completed version. This will assist us in better serving the multi-faceted needs of callers to the Assaulted Women’s Helpline.